According to the Castle Rock brewery website the name of the pub commemorates ‘the famous 19th century actor Edmund Kean, who once performed at the original Theatre Royale, which also stood on St Mary’s Gate’. 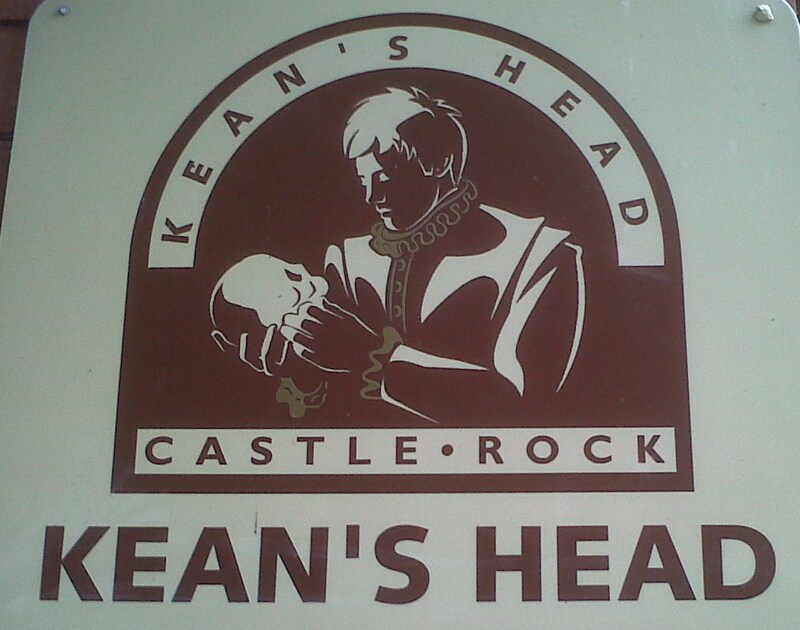 The sign over the door shows Kean holding a skull in Othello perhaps an ode to his final acting performance. Inside the pub your experience really depends on the day and time of your visit. I have been here on a Friday or Saturday night at about 8pm and the single room pub is packed out to the rafters and it is standing room only. If you come in earlier or on a quieter night then it is a far more relaxed affair and you can take your pick of the tables and sit to sup your pint and peruse the paper in relative tranquility. It was on one of those quieter moments that I popped into the Kean’s Head for something to eat and drink. The drink part was the easiest choice, that was going to be a pint of Castle Rock’s Harvest Pale. The food part took a little more thought. 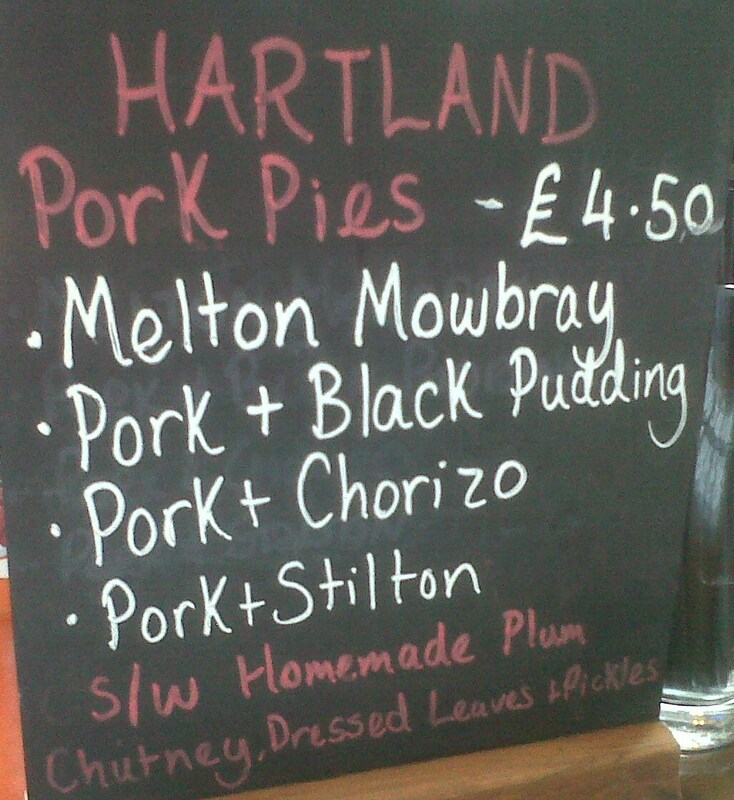 I could have had one of their lighter bite offerings such as a Hartland’s Pie or one of their home made sausage rolls. There was a passing fleeting thought that I would, but I have had both here before, so passed up both as an option. 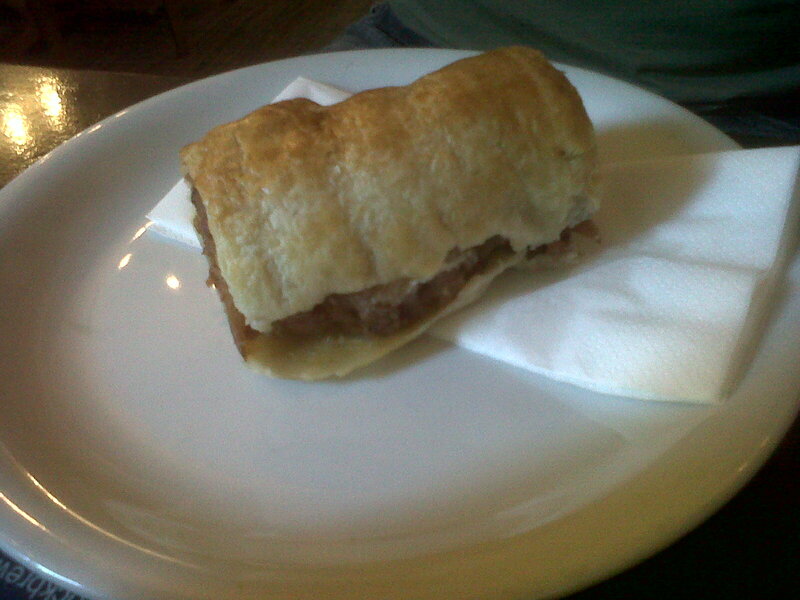 The other light bite that was almost tempting was the “Kean’s Head Scotch Egg and HP sauce” for £4.75, this was described on the menu as ‘a Kean’s classic that’s been a firm favourite since 2004′ . I was however somewhat more hungry so started to look at the specials board and the menu for something more substantial. The “Burger of the day” special from the chalkboard was the “Triple B” burger. This was a bacon and brie topped 6oz beef burger patty served in a focaccia bread bun with homemade chips. I surprised myself in some ways by choosing this combination as I am not a massive fan of the idea of Brie on my burger, but I am always seeing it listed amongst the popular options so I felt that the time was right to give it a try. I was to be pleasantly surprised, it was a different taste sensation, a not unpleasant taste but still a little unusual to my palate. It didn’t taste like Brie, something happens when the cheese melts inside the bun and mixes up with the juices of the burger and the saltiness of the bacon. The normal fruity creaminess of the cheese almost melded into a sort of meaty paste flavor, interesting. Ok enough about that topping, what about the burger? well it is a good meaty patty, I believe that it may have also had some bacon mixed in amongst the beef as there was definitely some textural contrast in each bite. As a I was eating this burger I was enjoying it more and more with each bite, not only were the patty and toppings quite delightful but the salad in the bottom layer a mix of fresh green crisp frisse lettuce, some sliced tomato, and a little bit of red onion and cabbage were a really nice contrast to the bite, there was plenty of it, but not too much to distract from the meat. This was all encapsulated inside a very decent focaccia bun that was soft inside with a light toasted crust and some nice light hints of rosemary. The burger was accompanied by a side of home cooked chips and for once these lived up to their name. Unevenly chopped chunks and wedges of crisply fried potato, skins still on freshly cooked and a little bit moorish. Best of all they had not been salted or seasoned so you could add you own as you so chose. This over insistence that some have of seasoning with excessive salt before it hits our plates is total rot and something that winds me up. If it was truly needed then there would be no need for the salt and vinegar pots on my table. As pub burgers go, this was one of the better ones I have eaten, it would not have been out of place sitting on the menu of somewhere slightly fancier. Mind you for £9.95 perhaps it thought that it was. I enjoyed my first Brie and Bacon burger experience but I may well return to my more indulgent fried egg topping next time I order a burger. 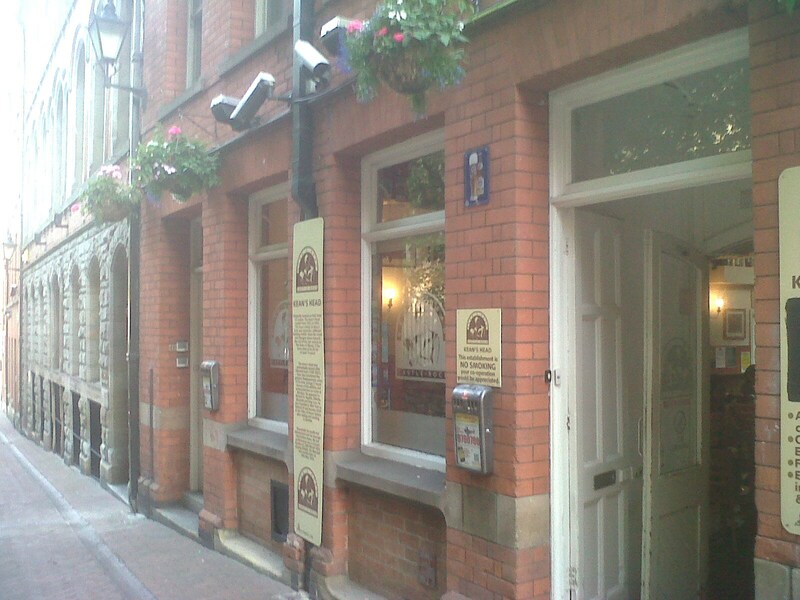 Kean’s Head is located at 46 St Mary’s Gate, next to St Mary’s Church and about 5 minutes walk away from the Lace Market Tram Stop. sounds good. is pretty far from me though as i”m in the USA. good to know for travel though!